The Rev. 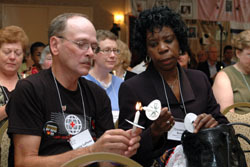 Constance Smith (right), pastor of Hughes Memorial United Methodist Church in Washington, lights a candle with Lonny LeFever. WASHINGTON (UMNS) — United Methodists from around the world gathered in the nation’s capital to hear that the church must get involved in the HIV/AIDS epidemic. “We need you, and more people like you, to become ambassadors for the United Methodist Global AIDS Fund,” said the Rev. Don Messer, a retired theological school president and a member of the fund’s board of directors. “Lighten the Burden,” held Sept. 8-9, was the first conference of its kind in more than 20 years. The event was sponsored by the Global AIDS Fund, created by the 2004 United Methodist General Conference, Board of Global Ministries and the Board of Church and Society. The statistics on HIV/AIDS are staggering. Attendees heard that nearly 40 million people have the virus worldwide. Sixty percent of those with the virus live in sub-Saharan Africa, and nearly five people die of AIDS every minute. 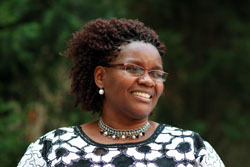 Participants were challenged at many levels to get involved in HIV/AIDS ministries in their local churches. That challenge was spelled out in a frank panel presentation Friday afternoon. Lonny LeFever is the education coordinator for the West Ohio Annual (regional) Conference’s AIDS ministry. He has been HIV positive for 23 years. Because of his sexual orientation, he told participants, he had many struggles as a child and eventually left home at 16. It was through a congregation’s outreach program to HIV/AIDS patients that he eventually returned to the church as an adult. Another panelist, Diane Carter, is an HIV/AIDS educator in the Washington area who visits schools and conducts workshops for young people. She has been HIV positive for years. For coordinators of the United Methodist Global AIDS Fund, retired Bishop Fritz and Etta Mae Mutti, HIV/AIDS is personal. Two sons, Tim and Fred, died from the disease in the early 1990s. “We are here to show the love of Christ to everyone around the world,” Mutti said, in his opening remarks. For many, overcoming the stigma of being a person with HIV/AIDS is something the church can help with. "Jesus cured every disease, scripture reports. What have characterized your efforts to heal God's world?" Musa Dube asks the participants. Musa Dube, associate professor at the University of Botswana’s Department of Theology and Religious Studies, offered the opening sermon. In it, she explained how the churches healing ministry needs to be recaptured to reach out to HIV/AIDS sufferers. The story of HIV/AIDS has traveled with her for the last 25 years, she said, and left many marks: denial, fears, silence, indifference, hopelessness, disappointment. Using Ezekiel 37, Dube invited United Methodists to see the spirit of the Lord “is inviting you to see the bones of 40 million people living with HIV/AIDS today; living with poverty and hopelessness; inviting you to listen to them. While saying that the problem is huge, and that only 150 people were present, she reminded participants that with God, nothing is impossible. 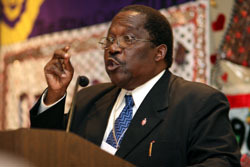 The Sept. 8 keynote speaker was Bishop João Somane Machado of Mozambique. In his sub-Saharan country, 1.7 million people are living with HIV/AIDS and 123,000 have lost their lives to the disease, leaving more than 300,000 children as orphans. Bishop João Somane Machado gives the keynote address at the conference. In Mozambique, most people cannot afford to spend U.S.$2 per day for food or medicine, the bishop said, because 60 percent of the population lives below that country’s poverty line. As a result, many people turn to prostitution, which only makes more people vulnerable to the disease. As a result, many people turn to prostitution, which only makes more people vulnerable to the disease. To combat the virus, many new ministries are being tried, he said. Bishop Machado talked of radio stations being established by churches to get information in the public arena; he talked of home health care workers being trained to assist HIV-positive women who are about to give birth; and he talked of hospital programs and education programs being offered. The goal of the Global AIDS fund is to raise $1 per United Methodist in the United States or about $8 million. The United Methodist Global AIDS Fund is an Advance Special of the United Methodist Church, #982345. Write that number on the memo line of a check and drop it in the offering plate at church. Credit-card donations may be made by calling (800) 554-8583. *Alsgaard is the director of communications for the Baltimore-Washington Conference.